In 2014, journalist Reni Eddo-Lodge wrote a blog post to try and express her frustration with the way race and racism are discussed in Britain. The post, “Why I’m No Longer Talking to White People About Race”, triggered an immediate and intense response from both white and black voices. In her first book, Eddo-Lodge expands upon her initial idea with a series of essays exploring topics such as white dominance, race in feminism, and the link between race and class. In her preface, Eddo-Lodge explains that she finds it difficult to converse with white people about race because they tend to become either disinterested, defensive, or deflective. Because race is a topic that largely does not affect white people, the author feels that they instead try to turn the conversation around to focus on things from their perspective, and by doing so they shut out the minority viewpoint. On one hand, I completely agree. I have attempted to have conversations about race with my family and friends and the results have been uncomfortable at best or aggressive at worst. On the other hand, it is generally difficult for humans to imagine a viewpoint outside of their own. Sympathy and empathy are developed by asking ourselves that age old question, “How would I feel if this happened to me?” By asking that question it seems only natural that one would need to use their own life experiences as a lens through which to view the question. In order to open a dialogue about race and racism in the modern world, we first have to view the world through our own lens and come to an understanding before we can attempt to view the world through the lens of another. If Reni Eddo-Lodge wants to have a conversation about race and racism, this would be a good place to start. But, in this reader’s opinion, she doesn’t want to open a dialogue. She wants to lecture. Right away, I hear voices in my head saying that I missed the entire point of the book and that I can never understand because I am white. However, I am simply referring to the preface. I actually found the majority of the book to be thought-provoking and insightful. My initial interest was sparked when I found out that it was focused primarily on race in Britain. When it comes to racially charged controversy, so much of the attention is focused on the United States that one tends to forget that it is alive and thriving in other areas as well. In her first essay, “Histories”, Eddo-Lodge points out that while Great Britain greatly benefited financially from the slave trade, they never had to witness the horrors of slavery at their doorstep, due to most of their “assets” being shipped to the Caribbean islands. So while America continues to deal with the aftershocks of slavery and segregation, Britain has allowed itself a certain level of moral superiority that it certainly hasn’t earned. Eddo-Lodge goes on to detail the difficult and violent history of racial minorities and immigrants in England, particularly when it comes to police violence and mob mentality. The other essay that I particularly enjoyed was entitled “The Feminism Question”. Here, Eddo-Lodge and I agree very closely. Her argument is that the feminist movement is largely made up of white, middle-class women who have more liberty to expound their feminist views both in the workplace and in society at large. I was strongly reminded of the Women’s March last year, wherein thousands of women around the world took the day off of work to march through the streets. I recall reading about women walking in to restaurants and other stores and disparaging the women who had not taken the day off. What I feel that feminism often forgets to take into account is that not everyone has the support structure to just take a day off work. If you are a salaried employee whose children are in daycare, it’s easy enough to take a vacation day. However, if you are an hourly paid worker who is struggling to make ends meet at forty hours a week, it simply isn’t feasible. And since a disproportionate number of these service and hourly waged jobs are occupied by minority race, that they are often left out of the feminist discussion simply by not being invited to the conversation. Really? Would she really prefer to live in a world of active racists rather than a world of people who are trying (and perhaps failing but trying) to understand an outside perspective? The problem is that in Eddo-Lodge’s worldview, she leaves no room for disagreement. Either I accept everything that Eddo-Lodge states or I am somehow complicit in the racist treatment that she has had to endure in her life. There’s no room for conversation here. All white people have benefited from white privilege, there’s no denying that. But I actively disagree with the premise that this makes all white people inherently racist. Which, according to her, makes me a racist? One cannot prove a negative, so how am I meant to convince anyone that I am not a racist? Is it even possible if they already assume that you are? If Reni Eddo-Lodge wanted to challenge people’s views on race and racism, she definitely succeeded with me. Consider that most of my reviews on this site average around 400 words, and this one is pushing one thousand. While reading this book I found myself constantly pausing and re-reading, going back over her arguments to think about them and how they pertain to the larger conversation of racism in the world. And while I did not agree with everything, this is definitely a book that will continue to stick in my brain for a long time. 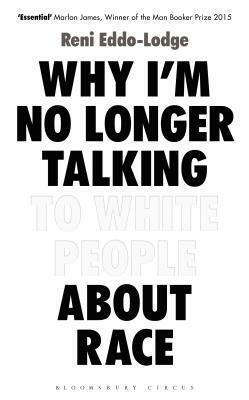 You can find Why I’m No Longer Talking to White People About Race here on Amazon and here on Book Depository.